Click here to download the Microsoft Identity and Access Management Series from the Microsoft Download Center. Identity and Access Management combines processes, technologies, and policies to manage digital identities and specify how they are used to access resources. The series shows how to achieve solid business results using Microsoft technologies in heterogeneous IT environments while concentrating on the key issues of total cost of ownership (TCO), security, and the growing need for information access beyond organizational boundaries. The series provides solutions that balance the need for short-term business results with a long-term security and management strategy. 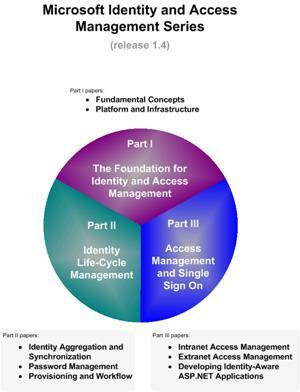 The following figure illustrates the content and logical divisions within the Identity and Access Management Series v 1.4. This paper describes key concepts, terminology, and technologies for identity and access management. It includes common business, technology, and security challenges and approaches for overcoming these challenges. This paper describes the common platform requirements and technology infrastructure for identity and access management solutions. This paper describes the approaches and technologies available for integrating identity stores across a heterogeneous environment. It also provides implementation guidance for identity aggregation and synchronization between Microsoft Active Directory forests, Sun ONE Directory Server 5.1 (formerly iPlanet Directory Server), and Lotus Notes with Microsoft Identity Integration Server 2003, Enterprise Edition (MIIS 2003) with Service Pack 1 (SP1). This paper discusses how to automatically provision identities into multiple directories and identity stores in a heterogeneous environment. It also discusses managing security and e-mail group memberships, and describes a workflow process that can extend automated processes. You can use the information in this paper to enable the automated administration of user identities and reduce costs while you increase the availability and security of information resources. This paper also provides detailed configuration tasks that you can use to achieve these results by using MIIS 2003 with SP1. Integrating UNIX workstations with Active Directory. Integrating SAP R/3 Application Server authentication using the Kerberos version 5 authentication protocol. B2E extranet Web access and SSO using X.509 certificates. B2C extranet Web access and SSO using Microsoft Passport. Intranet Web applications that use Windows-integrated authentication and Windows Authorization Manager. Extranet Web applications for B2B, B2C, and B2E scenarios using Windows authentication (including Forms-based authentication, X.509 certificates, and Microsoft Passport) and Windows Authorization Manager. Several code samples and configuration files accompany each paper in the Identity and Access Management Tools and Templates.msi file that is part of this download. How to access the Tools and Templates. Style conventions in the papers. Consulting services and system integrators. Independent hardware and software vendors. This paper includes key concepts, terminology, and technologies, as well as identity and access management challenges and approaches for overcoming them. This paper is prerequisite reading for the other papers in the series. This paper defines common platform requirements and a technology infrastructure for all of the identity and access management solutions in the series. This paper describes the approaches and technologies available for integrating identity stores across a heterogeneous environment. It also provides detailed implementation guidance for identity aggregation and synchronization between Microsoft® Active Directory® directory service forests, Sun ONE Directory Server 5.1 (formerly iPlanet Directory Server), and Lotus Notes using Microsoft Identity Integration Server 2003, Enterprise Edition (MIIS 2003) with Service Pack 1 (SP1). Intranet Password Management: This scenario uses an intranet Active Directory forest as the password master (for policy), propagating password changes to Lotus Notes and Sun ONE Directory Server 5.1 using MIIS 2003 with SP1. Extranet Password Management: This scenario uses sample ASP.NET code for password change, self-service password reset, reporting, and a scheduled script for password expiry notification. HR-driven Provisioning: This scenario describes how HR can be used to drive fully automated provisioning to a heterogeneous environment. The scenario will use SAP as the HR system and provisions accounts in the intranet Active Directory, extranet Active Directory, Lotus Notes, and Sun ONE Directory Server 5.1 (formerly iPlanet Directory Server) using MIIS 2003 SP1. Group Management: This scenario describes how to have security groups and distribution lists automatically managed based on identity attributes such as manager, location, etc. The scenario will use Group Populator (included with MIIS 2003 SP1), a SQL table for group definitions, and provides a basic ASP.NET Web UI to make it easy for an administrator to establish computed groups based on manager, location, and other attributes. Contractor Account Provisioning: This scenario describes how to implement a provisioning workflow application using ASP.NET and MIIS 2003 SP1 that facilitates the creation and provisioning of contractor accounts within the heterogeneous Contoso environment. Security Solution Accelerator Site – to know about other solution accelerators that focus on security. Solution Guide for Windows Security and Directory Services for UNIX provides guidance for enabling Microsoft Windows Server™ 2003 Active Directory, the Kerberos version 5 protocol, and LDAP services for authentication and authorization within heterogeneous Windows and UNIX environments.